Learn how to manage user accounts and groups. We walk through how to add and delete users and groups (normal and system). Find out how to add/remove existing users to/from groups and how to create an admin account. Ubuntu and other Debian based linux distributions use user friendly wrapper commands called adduser, addgroup, deluser, and delgroup (the commands are actually implemented as scripts written in perl). These commands hide underlying calls to the low level commands useradd, groupadd, userdel, and groupdel. You can still use these underlying commands if you wish, but it is recommended that you use the friendlier adduser, addgroup, deluser, and delgroup commands. 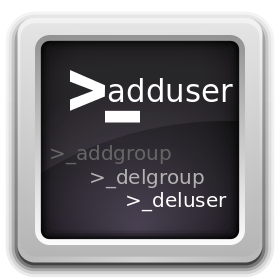 (Advanced users can fine tune the operation of adduser and addgroup by editing the configuration file /etc/adduser.conf as required). Sample output is shown in the screenshot below: By default, a home directory will be created for the new user. This home directory will be populated as per contents of the /etc/skel directory. Our /etc/skel contains all the usual files and dirs you'd expect in a home dir, along with another directory called "Code". Hence all these dirs are created for each new user created via command line. Note that you will need to populate /etc/skel with the files and dirs you require. Also note that the .profile, .bashrc, and .bash_logout are already in the default /etc/skel directory. In Ubuntu, the next available user id above 1000 is used by default when a (normal) new user is created (the same is true of the group id). When you create a new user, they are added to a "primary" group. Every user has a primary group, which gets used as the basis for the group related permissions when new files are created by that user. When no group is explicitly specified in the options to the adduser command, a group with the same name as the new user is created (if it does not already exist) and the new user is added to that new group. So taking the example above for the new user tutonics2, a new group called tutonics2 is created also. You can change this behaviour and specify a group id to use via the --gid option or group name using the --ingroup option: e.g. to use group "users"
Note that if the user had their own group with the same name, that will get deleted also (if there are no other members). 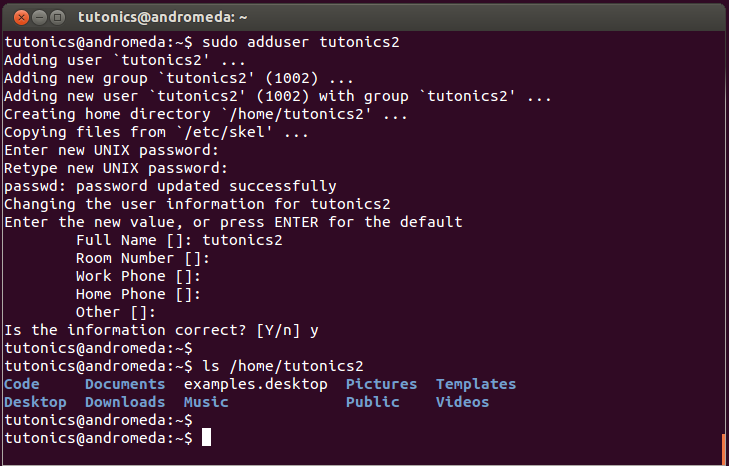 In Ubuntu, anyone in the sudo group can run any command (as long as they use the sudo command when required). A system user is a user created for an application/process/daemon on your system. For consistency, system users are given a uid below 1000 while normal users are given a uid above 1000. A system user normally doesn't need to be able to login (so its shell is /bin/false, unless the --shell option is used to specify one), and most of the time will not even need a home directory. By giving processes their own user and group, you can control what files they have access to and keep them from being able to write to any file (Having a daemon run as root with access to all files and resources is considered bad practise - It may need to start as root to access a resource, but should then have its permissions lowered by setting its user and group to that of its specified system user). Alternatively, you can create a group for that system user using the same name by including the --group option. However, for consistency it is advised to stick with the standard convention of having system group ids below 1000. You can delete a system user in the same way as a normal user.